Riyadh (Arabic: الرياض‎ ar-Riyāḍ, lit: The Gardens) is the caipital an lairgest ceety in Saudi Arabie. It is an aa the caipital o Riyadh Province, an belangs tae the historical regions o Nejd an Al-Yamama. It is situatit in the centre o the Arabian Peninsula on a lairge plateau, an is hame tae 4,854,000 fowk, an the urban centre o a region wi a population o close tae 7 million fowk. The ceety is dividit intae 15 municipal destricts, managed bi Riyadh Municipality heidit bi the mayor o Riyadh, an the Riyadh Development Authority, chaired bi the Govrenor o Riyadh Province, Prince Salman bin Abdulaziz. 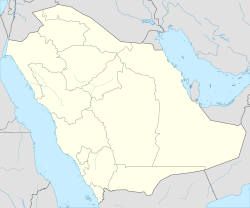 The current mayor o Riyadh is Abdul Aziz ibn Ayyaf Al Migrin, appointit in 1998. Wikimedia Commons haes media relatit tae Riyadh.